As a rule, a takeaway Thai curry is something to be avoided as it is laden with calories and saturated fats, whilst the traditional accompaniment of sticky jasmine rice has a sky high GI and a rock bottom fibre content. This recipe allows you to still enjoy the flavour of a Thai curry (red or green is up to you) but with a fraction of the calories and saturated fats and a big, lean protein hit. Using lots of veggies in the curry and serving with wholewheat noodles, boosts the fibre content considerably. 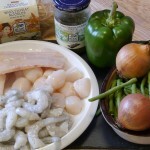 You can use any fish you like (frozen is cheaper and convenient) though we like a mixture of haddock or basa, scallops and prawns, or Quorn or chicken. Soften onions and pepper in a few squirts of fry light. While onions are cooking, prepare veggies and partially cook: I do the green beans for 5 minutes and the mangetout for 2, Drain and refresh in cold water before draining again. Once onions and pepper are soft add the curry paste and stir for 2 minutes. Add coconut milk, stir well and leave to simmer for 20 minutes. Bring a pan of water to the boil and add noodles which should take about 6 minutes to cook - just long enough to cook the fish. Add the veggies, haddock and scallops to the sauce, cover and cook for 3 minutes. Drain the noodles and serve.